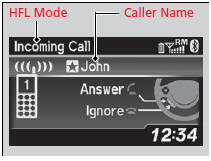 When there is an incoming call, an audible notification sounds (if activated) and the Incoming Call screen appears. Press the button to answer the call. Press the button to decline or end the call. Press the button to put the current call on hold to answer the incoming call. Press the button again to return to the current call. Ignore the incoming call if you do not want to answer it. Press the button if you want to hang up the current call.